Content Marketing is an evolution of technology and processes that support strategies for reaching the right customers with the right information across the buyer’s journey. Brand messages address pain points and goals for specific customer segments as well as the messaging that supports the brand’s leadership and unique selling proposition in the marketplace. Growing content marketing performance means optimizing the ability to identify topics, content types, distribution channels and offers on an ongoing basis. Content marketing is the planned creation, promotion and optimization of brand stories designed to create useful and meaningful experiences that attract, engage and inspire a target group of customers from awareness to purchase to advocacy. While I have an opinion and will explain why I use the definition above, it’s not reasonable to think that only one person can stake a claim on what content marketing is, for everyone, everywhere. However, when people make sweeping generalizations or simply parrot what others say without understanding for themselves, things can get a bit cloudy. That leads to wasted time, money and opportunity. This is why I offer my own version of a definition. If you’re interested in my rationale, here’s a bit of a breakdown. Content Marketing involves planning. As in architecture. A vision for what the result is to be and how to get there. There are many pieces to the puzzle, from specific customer segments, the buying cycle for each segment and the relevant topics for each stage to content types, promotion methods, repurposing tactics and measurement. It’s a cycle of hypothesis, plan, implement and optimize. Content Marketing focuses on a defined customer group. As I’ve mentioned, understanding the customers you’re designing content for is pretty important if you want it to be meaningful. Marketers have used data analysis to segment customer groups for many years and that insight can help the understanding of “best customer” characteristics. Advanced content marketers will plan, promote and optimize content specifically for the information needs across the buying cycle for that specific customer group. Content Marketing is creation. Text, images, video, audio and any other kind of media is essentially content. Although, our survey on this revealed other opinions. The point is that content marketing is about creating new things that serve a need, as well as curating, mashing up, and co-creating too. Content Marketing is promotion. You know the drill: “Great content isn’t great until it gets found, consumed and shared.” One could even add, “acted upon” to that quote. Part of planning and creation must factor the amplification of content in order for it to compete and reach your target audience, the people who influence them and those that they influence in turn. Content Marketing involves telling brand stories. “Facts tell, stories sell” is as true here as it is in sales. While empathizing with the customer journey is a way to give customers what they want, sometimes they don’t know what they want. And brands have to tell them. At the same time, its important that the brand communicate it’s USP and what it stands for. How does your brand want to be known? Answer that and then fill in the gaps by understanding the voice of the customer related to those key messages and solutions. Content Marketing provides useful information. Jay Baer says, “Make your content marketing so useful, people would pay for it if you asked them to.” To create useful, utility focused content, you have to understand the pain points, goals and preferences of your customers. It’s part of a “give to get” mentality that means creating value first, through useful information as a part of the customer journey from awareness to interest to purchase and especially with retention and advocacy. Content Marketing creates experiences. When we did our poll about what content is, one of the categories of answers focused on the outcome of content – experiences. Successful content marketing does indeed create an experience and each content object should be mapped to a plan for creating those experiences as part of the buyer’s journey. As I like to say, evaluate your content not just based on how good it sounds or whether it makes sense, but how does it make you feel? Content Marketing attracts. The buyer journey often starts with awareness of your company and/or solutions. People that are actively looking to solve a problem will often pull themselves to content that helps. Optimizing content for search keywords and social topics is “attract marketing”. Don’t miss out on this most important of discovery channels so your brand can “be the best answer” at the very moment customers are looking. Content Marketing engages. Tied to creating an experience, content needs to provide information in a context that makes sense to solving a problem or helping the customer see that their goal is within reach. To achieve this, it’s essential to understand what topics and ideas are important to the customer as well as the language they use to describe what’s important. Content Marketing inspires. Content that’s useful and makes you feel good about the brand that published is great, but not worth much unless it results in a desired action. Content Marketing means understanding triggers and buying signals so that information is optimized for action. Action can be something as basic as a social share or signing up for a demo, a transaction or a referral to another potential customer. Content Marketing guides the buyer’s journey. While most content marketing definitions and practices focus on guiding buyers to transactions, the value of retaining customers and inspiring brand advocacy must not be underestimated. Content Marketing plays a significant role in customer marketing which can fuel the cycle with qualified buyers at a fraction of the cost of typical new customer acquisition. Content Marketing is optimized. With customer data, clear brand goals and a tactical plan to implement editorial creation, a content marketing strategy will create numerous and ongoing opportunities to monitor and refine performance. Identifying goals and the key performance indicators that lead to their achievement map directly to ongoing content performance monitoring and measurement. Insights from analytics and gap analysis enables marketers to optimize their content to better attract, engage and convert new business. Optimization is a continuous process of improvement and distinguishes leaders from the lucky in the content marketing world. That’s my take on what content marketing is. Maybe you agree. Maybe you don’t. At least you can take what makes sense and incorporate it into how you’re developing your content marketing strategy. The idea is to advance and it’s tough to do that if you don’t know your starting point or aren’t clear on what content marketing can do for your business. So, what do you think of my definition? Does it work for you? What stage of content marketing maturity are you in? What could help you move from wherever you are to the next level? 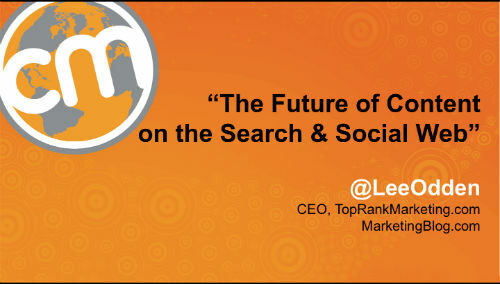 Don’t miss my deep dive into this topic at Content Marketing World: The Future of Content on the Search and Social Web – Sept 10th at 9:45m. Good post Lee…I think the thing in my experience that you said which rings most true is “Content Marketing provides useful information.” We see this true for a lot of our customers who don’t know how to quite manage that best since the question becomes “what is useful”….so they end up adding some kind of public Q&A tool for this very purpose…so they can turn naturally asked questions into valuable content that leads to traffic. They can also see what questions are drawing the most search engine traffic and make those into more detailed posts diving into the subject further…and optimizing that for the search terms they’re seeing for the Q&A pages. It ends up creating a nice cycle of useful content. There are some easy plugins out there that can achieve this…a few possible options are Answerbase, Qhub, and Shapado….can be useful in the building valuable content area. Thanks James. The cycle you describe is excellent and a lot easier to make a habit than most companies think. Thanks for the plugin-recommendations too. So true: 50 different marketers = 50 different definitions. As you said, it’s important to understand the principles that go into content marketing because it takes both time and energy to do it all…and do it right. Thanks Jen – great advice for all marketing too, right? Lee – You have captured it well. I do see an important opportunity to extend cotent marketing to sales teams. The great content created by marketing is now what all sales teams need. Buyers are demanding sales people who can provide unique insights and then help them through their buying journey. I suggest that in the new sales world, marketers need to extend content marketing to include how to educate the sales team on content and how to use it in their interactions with clients. That’s a great point Cliff. Empowering sales teams with content and social media support is a great way to scale reach and engagement earlier during the sales cycle. Very detailed and comprehensive post lee, i think being a part of content management team at Synechron, i very well understand the technicalities involved in writing a good piece of writing.however, the same is not understood by all, i am sure your post will help in enlightenment of many individuals. Thank you: this is such a good explanation of the purpose and method of content marketing. I’m going to hold on to this to share when I’m trying to explain what content marketing is. And I love the four stages of content marketing you’ve laid out: that makes a lot of sense, though some brands might skip straight from production to storytelling, don’t you think? Thanks Unmana. I think a company can advance to whatever makes sense for their customers.